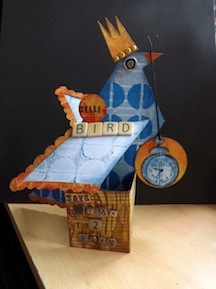 Just a taster – Gelli advent calendar? DOH! 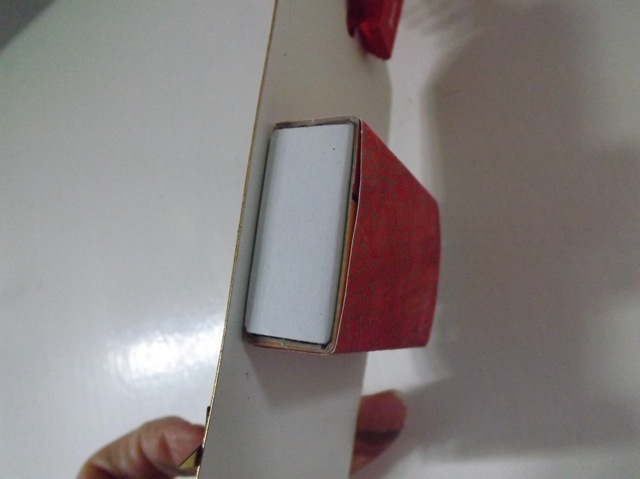 DD informed me that the advent calendars I’ve already made aren’t Christmassy enough – I’m not a big fan of the traditional red and green shades, so one is hot pink glitter, burgundy and lime with a lot of white and the other one is very vintage, with lots of brown. 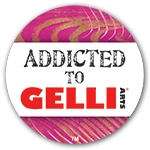 So I really loved the look of the Gelli pulls over gold embossing, and I selected a couple of stencils that show thru the embossing nicely – all circles, to unify them. 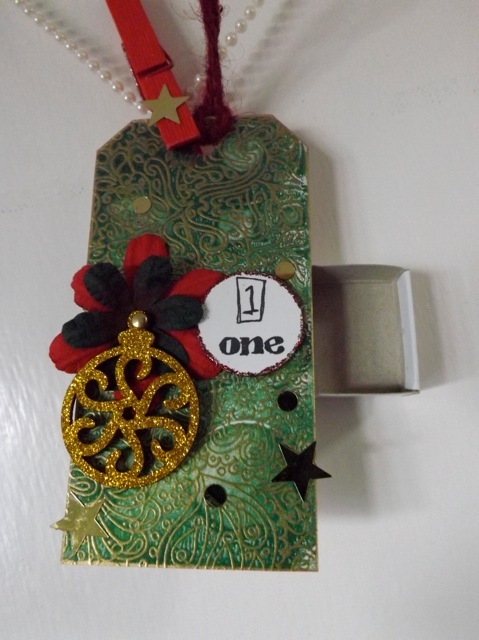 I also still have a few of the gold embellishments from the last advent calendar I can use – DD did like them. Phew! Really, how could she NOT like that?? I always opt for a grungy sort of font with anything Gelli, as I think it suits the style better, but I am not 100% happy with these. Now I’m thinking maybe a black stencil surround? Maybe I’ll have time to play tomorrow and see. Oh and it may not look it but that dark flower is really a forest green, not black! Just push it open from one side or the other to clam your surprise. Hope she likes this one better – I’ll know tomorrow…. 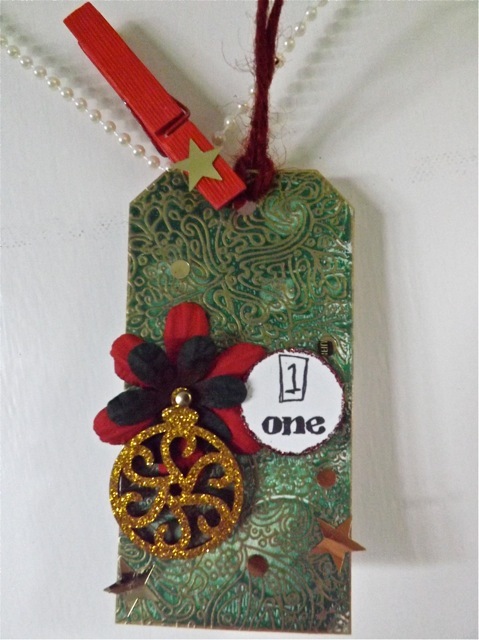 Categories: calendars, Christmas, Gelli plate monoprints | Tags: Advent Calendar, calendars, Christmas, Gelli plate | Permalink. 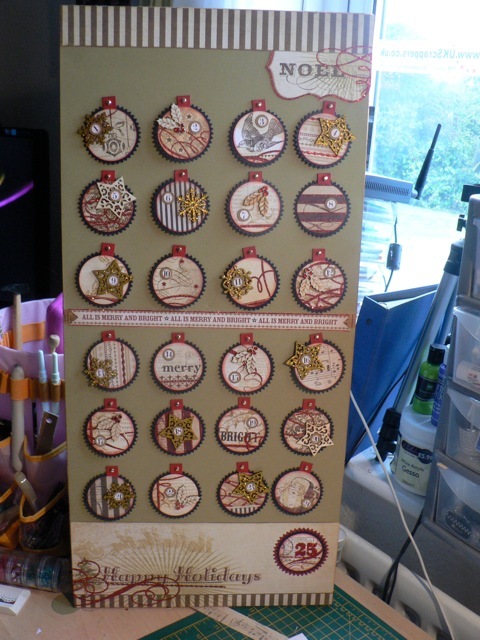 I love the vintage advent calendar.! It’s gorgeous! Christmas does not have to be strictly red and green. I did create a Blogger blog at some point but never really got on with the interface. I found WordPress a lot easier to use, and you get such a lot of “free” space for adding photos, etc. (3 GB at least – I’ve been blogging for years and still have YEARS of space left to use) The other reason is more personal 🙂 I really resent the way Google collects info about you, so, like with Facebook, I tend to only log in when I need to do so for something very specific then log out immediately. With a Blogger blog you have to be logged in continuously and then every thing you do is captured. I don’t think there is a practical way to avoid them collecting anything (clear your cookies after every session online, never use the Google search engine, etc) but I prefer to minimize it as best I can – I’m weird that way :D.
I also like the look of the WordPress themes better – I’ve not explored it fully but I do know at the time I created the Blogger blog the only option was the standard three-column format and the middle area, where the core info was, was so thin and squished to my eye I didn’t like it. I really like the new improvements they have rolled out – like the Gallery option for photos. If you look at the post about the Gelli print packing tape you can see it in action – a grid/mosaic of photos that gets 5 or 6 photos in a smaller screen space, and when you roll over them with the mouse you can read accompanying text. When you babble on like I do and add a ton of photos to most posts, that makes a difference 🙂 If you are a one-photo and a bit of text blogger, it probably won’t matter. Loads of people love Blogger and love they can get a pretty interface for free and change it at will. I can pretty up my WordPress blog but it’s all down to me and sometimes takes a bit of tweaking to get it right. In addition, I always intended to move to a self-hosted blog, not on the WordPress.com platform but on a server of our own. I don’t know if that is even possible with Blogger. I felt the option to do that gave me more options for control of my blog and the info I posted. I may never do that but I want the option to do it if I feel it’s the best thing to do. I love the Askimet spam filter – it works very well, with very, very few things marked as spam that are not, and even fewer things that appear as a comment that are actually spam. Blogger seems to have a worse time with spam. I can allow comments to not await approval and many just appear as soon as they are entered, and Askimet weeds out the spam without me needing to approve every comment before it appears. There are some WOYWW blogs I can’t comment on unless I sign in to Google (Julia’s,who hosts WOYWW, is one) and at least one that demands Google+ to comment, so I don’t, which I hate. That’s down to spam protection. Don’t even get me started on the whole Word Verification thing on Blogger…..
People have said to comment that have to log in to WordPress but I’m not sure that is true – I do have Open Id enabled so people SHOULD be able to comment with whatever platform the are logged in on (WordPress, Google, Live Journal, Typepad and maybe more) – I never visit my blog not logged in from a different machine so I can’t be sure what the story is. I must ask maybe at crop if someone has their iPad hand, if I can see what they see and know. Jeez that did go on a bit. Hope you see it and hop it helps you decide. I do see a WP blog address in the email notice, in the URL section, so maybe you did begin a blog at some point? Clicking it tells me the blog can’t be found 🙂 It might be quite easy to reactivate it, and I believe moving a blog from one platform to another isn’t impossible so even if you hate it you might be able to migrate what you have done over to Blogger. Or vice versa – create a Blogger one then move it to WP. Must stop. 🙂 Feel free to email me if you have specific questions. Where are you? US or UK or elsewhere? Not willing to make a transatlantic call but if yo are in the UK I’d be up for a chat if it’ll help …. Is this one if those times when DD becomes A (for annoying) D? I’d live the original one if you’d like to send it to me! It’s more than festive enough for me.